The works in No More Elsewhere present a series of interpretations derived from the encounter with the continent of Antarctica through the watercolours, drawings and writings of explorer, Edward Wilson (1872-1912). Wilson was one of the fated members of the Scott party who died on their return from their failed quest to be first to the South Pole. 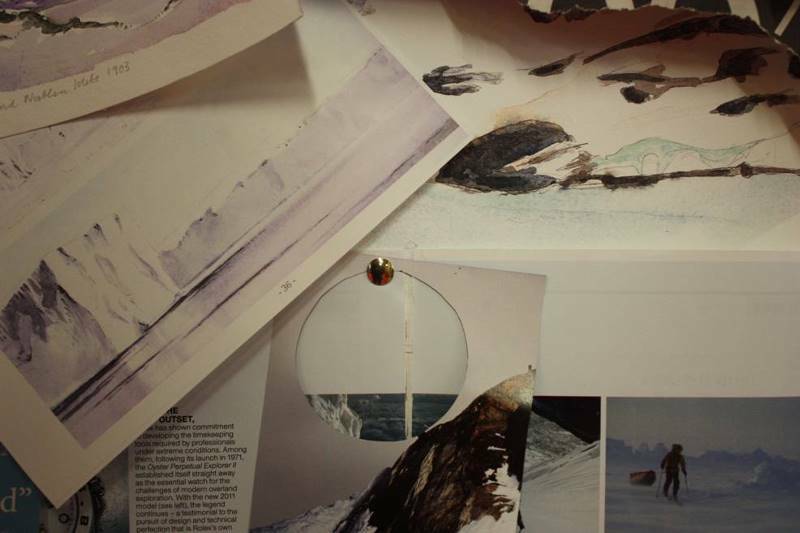 The freezing conditions of Antarctica make painting watercolours challenging, with even one's own breath coating the paper with a layer of ice1. In works using pencil drawing, watercolour on paper and painting on sand-blasted glass, free-blown and moulded glass, and the light of a magic lantern, Gould explores some of the paradox of attempting to use watercolour in a sub-zero conditions and the challenge of representing this frozen continent. No More Elsewhere refers to the past of a yet to be explored Antarctica, but also refers to the future disappearance of the melting icecaps, and to a time when the evidence of their existence is preserved in the ephemera contained in climate-controlled atmosphere of air-conditioned archives. Antarctic Archive 2013 is an on-going newly made archive of copies and reproductions, hand-painted watercolour versions of Wilson’s work, found newspaper and magazine articles, postcards, and photographs, pinned on the wall in a constellation of new arrangements at each subsequent configuration. 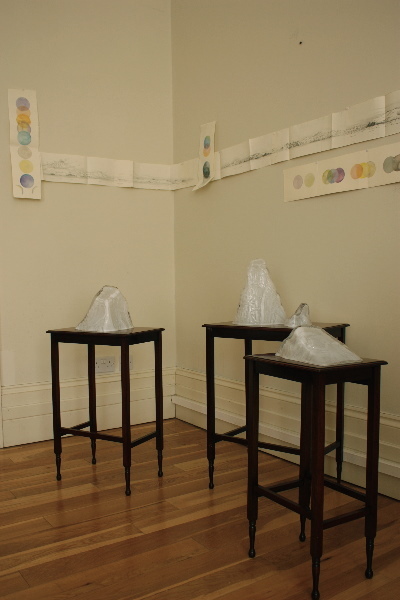 Horizon (false horizon) 2013 is comprised of hand-drawn pencil drawings of Wilson’s panoramas alongside circles of watercolour that stand for translations of Wilson’s colour annotations in his original field sketches. In the Anamorphic Landscape 2012 – 2013 works, disparate landscape views from the Wilson archive are painted onto sand-blasted glass. Their distorted shape is corrected when reflected in hand-blown mirrored glass spheres. 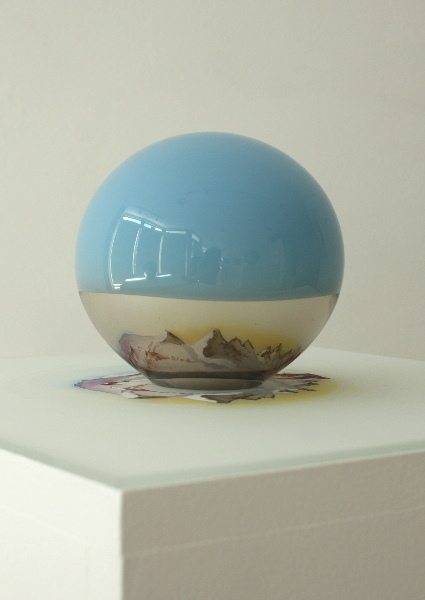 When encountered at the optimum angle and distance, these globes present enclosed, miniature landscapes. As the viewer moves around them, they apparently fall off the edge of these reflected worlds. Miniaturisation is at play, too, in Suiseki Bergs 2013. Pieces of hand-blown moulded glass, in the form of icebergs, are placed on Edwardian mahogany tables. The name indicates the oriental reference to the Japanese appreciation of small rocks taken to stand for mountains. The huge iceberg is reformed in a glass version of domesticated ornamental dimensions. 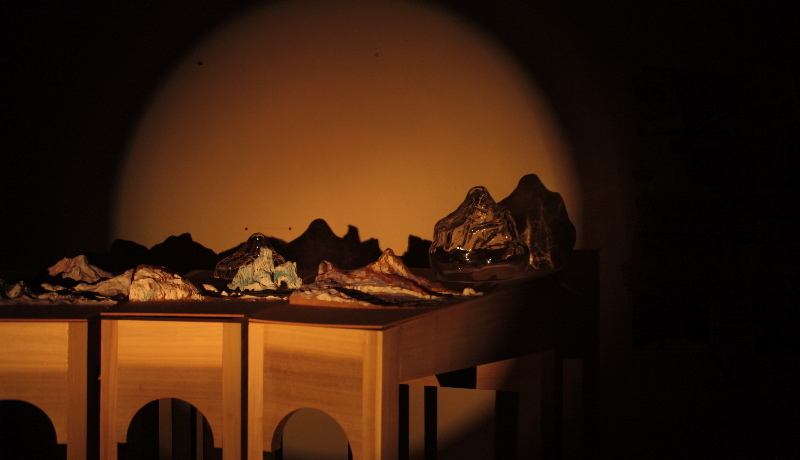 Lantern Landscape 2013, is an installation with magic lantern projector and painted wax models derived from the Wilson watercolours, set out on raked stages with the lantern light casting a shadow land in the back wall of the room. ‘What is required here is a copyist,' wrote Wilson in his pencil notes for a lecture on sketching in Antarctica meant for the entertainment of his fellow expedition party in the long dark winter nights of 1911. He felt a responsibility to inform audiences back home with accurate impressions of an environment that they would be unlikely ever to experience first hand. His lecture on sketching for the men in the hut was a mirror image of the educational tours of Edwardian drawing rooms and lecture theatres that Wilson undertook on return from the Discovery Expedition of 1901-04. For the closing event on 16th June 3pm, Polly Gould presents a performance lecture, referring to Wilson’s notes on sketching and to the documentary photographs of a magic lantern show from the 1911 Antarctic expedition, to further consider the spectacle of this contested territory which for most of us exists only as images. Polly Gould is an artist and writer based in London. In 2012, as part of Eggebert-and-Gould, she curated the show of international artists and associated publication titled TOPOPHOBIA, Fear of Place in Contemporary Art which toured to Danielle Arnaud, London, Bluecoat Liverpool and Spacex, Exeter. She is currently an AHRC funded doctoral candidate at The Bartlett School of Architecture, University College London. Cherry-Garrard The Worst Journey in the World 1922.